Filled with almost anxious anticipation I (Astrid), together with Linus, arrive in Guatemala City. We are picked up at the airport by Edwin Jr. Martinez, our producer and friend from Finca Vista Hermosa, and his colleagues from Onyx Coffee Blake and Julio. The drive through Guatemala City to Edwin’s grandparents’ house is overwhelming. The streets seemed closed off by walls, wire and billboard upon billboard. From the back of a bus, a Guatemalan version of Pamela Anderson is smiling back at us. I think she is beautiful and for a second I feel at home, but that feeling quickly disappears as I look through the barbed wire into yet another closed off area, set up to keep the citizens of Guatemala City safe. Even though we’ve been here for less than an hour, it quickly becomes clear how different from home this city is and how much poverty there is in this country. As thoughts about healthcare systems, human rights and equality in the world begin to sink in, we turn left and drive through the gates and barbed wire. We pass a guard and continue into to the secure area, where Edwin Jr.’s grandparents’ house is situated. Here the citizens of Guatemala City can live and feel safe and this is where our journey begins and from here on out, its all gonna be about coffee farms, people in coffee and coffee production. 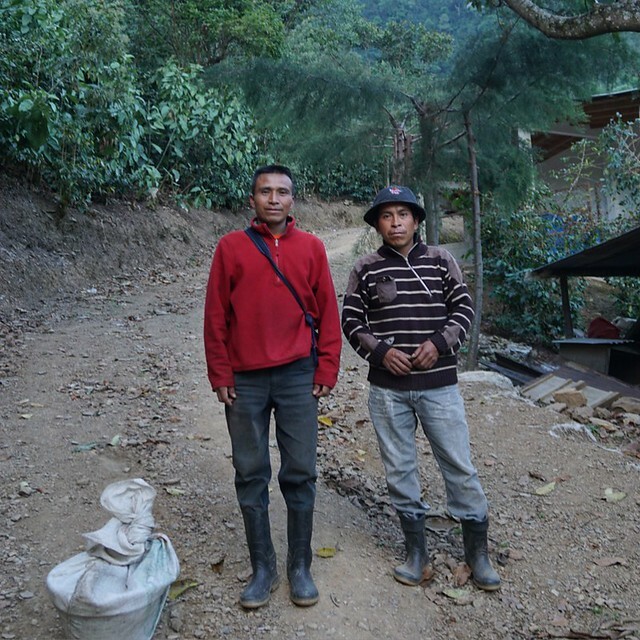 The first people we meet upon arrival are not from Guatemala and they do not work on coffee farms. 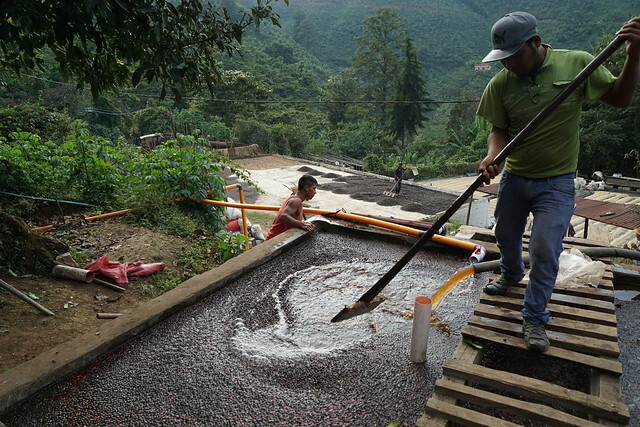 They have nothing to do with the coffee plants or coffee cherry picking, but they do work in coffee, albeit in the other end of the coffee chain. 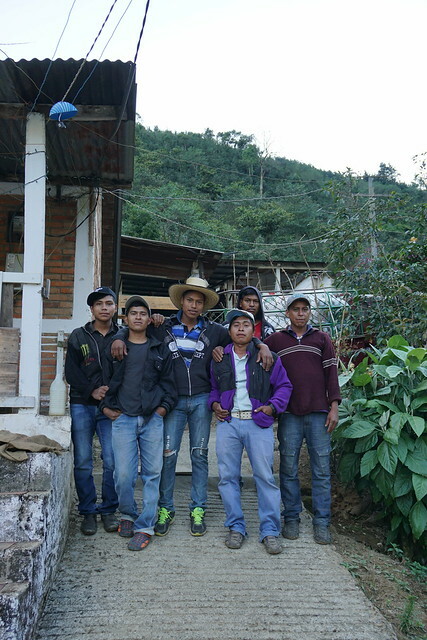 They are the coffee buyers and coffee roasters from America and we are all here to buy Direct Trade coffee from Huehuetenango, a coffee region in Guatemala. We wake up at 0400 with a long day and a lot of elevation ahead of us. If all goes to plan, we will arrive at our mountain destination of Huehuetenango before the sun sets. On the way to Huehuetenango things went wrong. One of the cars broke down, causing a long delay. Two of the American roasters got stuck behind a riot, causing another long delay. From my perspective, this was amazing; I’m riding in the back of a pick up truck that’s moving through coffee country. On the side of the road I can see mothers carrying their child on their back, dogs running and chasing cars; which to me seems really dangerous, but in Guatemala a lot of dogs are wild animals and are not like my fat dog at home sleeping on the couch; houses made out of clay bricks, children selling gasoline on the side of the road, a horse, women carrying baskets on their head, people selling watermelon and bananas and butchers hanging the raw meat in the shade of their clay brick house. Yes, more time on the back of the pick-up truck would definitely let me see more of this country and hopefully give me more perspective. Coffee production is one of Guatemala’s original commercial developments and is of vital importance to the national economy. In 1998 coffee exports brought in US$586.3 million, almost double the amount of what sugar (the next most profitable agricultural export in Guatemala) brought in. This means that coffee production is integral to sustaining living conditions for a lot of people in Guatemala, which makes our Direct Trade trip to Guatemala seem even more important for me. Over the last 4 years’ leaf rust (a fungus disease that attacks coffee trees), also known as roya locally, has been attacking the area of Huehuetenango. The cost to the farms has been tremendous, with a large share of the total crop being lost to the disease. 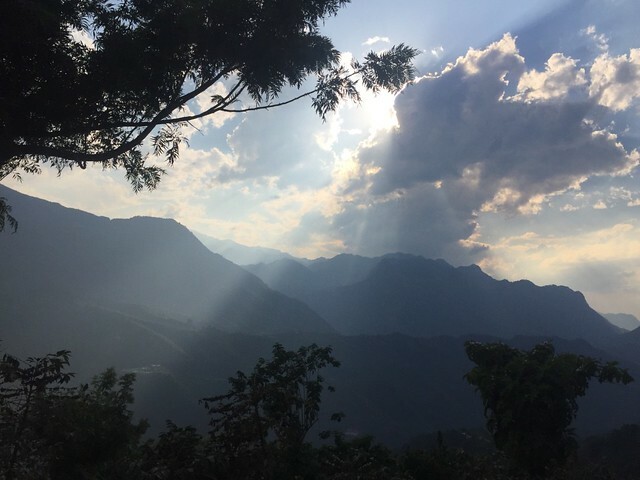 When you drive trough Huehuetenango and its beautiful mountain setting, it becomes apparent just how important it is for the farms to produce coffee and their dependence on the yearly harvest. The coffee farms employ a lot of coffee pickers every season and these pickers use the money they earn on the farm to support themselves and their families throughout most of the year. We meet Edwin Sr., Edwin Jr.’s dad, when we arrive at Finca Vista Hermosa. 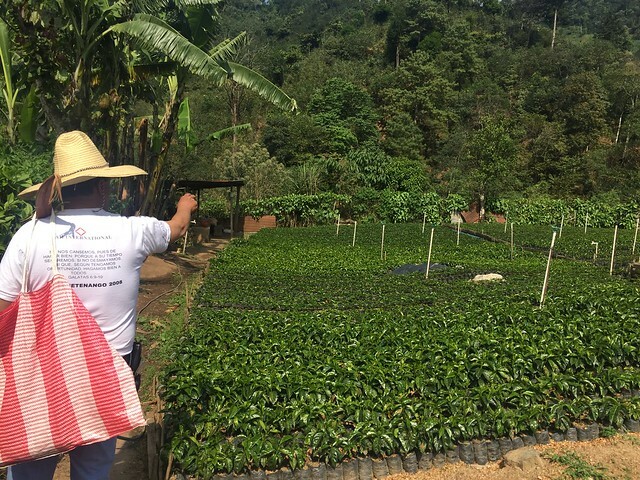 We visit the individual coffee farms, literally traversing the mountainside to inspect the crop, and talk to the farmers. We visit the nurseries on the farms, we pick coffee cherries to taste, we see the pickers bringing in the harvest at night, we carefully follow the after harvest processing; and we get excited about how important this process is and how well they are doing it; we visited the community that the pickers live in together on the mountain side and we saw red cherry upon red cherry. And every night I closed my eyes and thought about just how important it is, that all these people get paid for the important job they are doing everyday, so that I can drink a high quality cup of coffee every morning and every afternoon all year round. 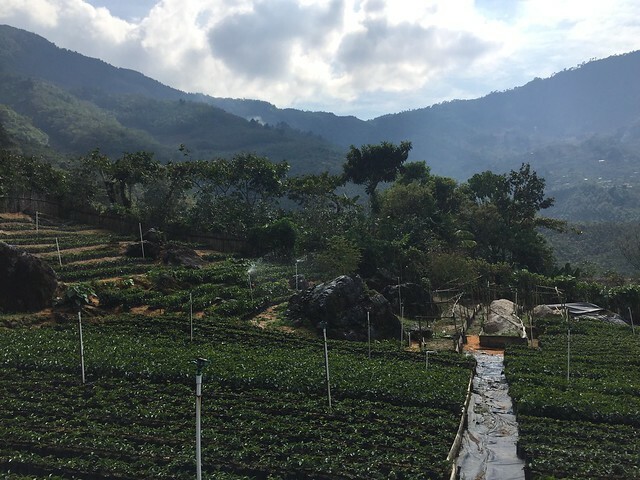 We visit a lot of different farms, but our visit to Las Rosas, a farm from which we bought a Geisha coffee from last year, is a stand out. To reach Las Rosas we are in the back of a pick-up, driving through the coffee tree covered mountains. On one side of the mountain we are hit by the nauseating smell of fermenting coffee cherries, while our arrival on the other side is announced by the scent of coffee flowers in bloom. This shows how a small area of land has very different micro climates and very different growing conditions. The closer we get to Las Rosas the wilder the mountains look. As we reach the end of the road we park the pick-up, climb out of the back and start walking. What a beautiful view; as far as the eye can see there are mountains upon mountains and, as if drizzled randomly, smalls sheds jut out of the landscape. Each of these small sheds are home to very, very small producers; their farms’ handed down through the generations. We reach the top of the mountain and Las Rosas. Here we meet Rolando Villatore and his dad at their wet mill next to the patio. From here we venture further up the mountain and walk in between their coffee trees. We discuss roya, both its effects and what they are doing at Las Rosas to combat the disease. Day 6 – If you wanna know, go to the source. 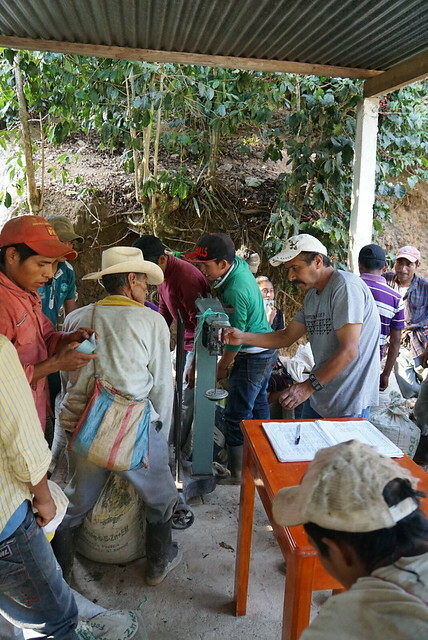 Over the last 4 years Roya has attacked Huehuetenango as a whole, including the farm Finca Vista Hermosa. 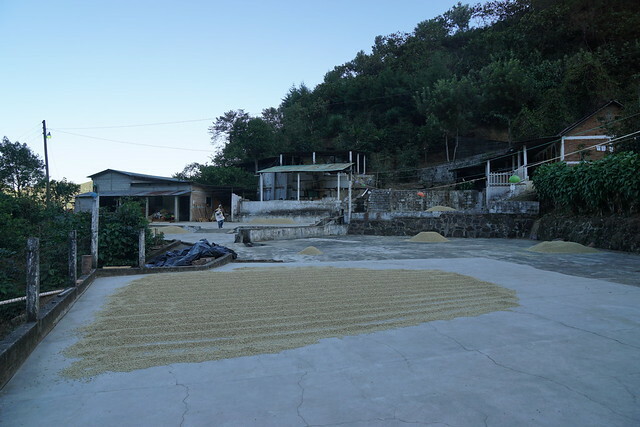 Last year’s production at Finca Vista Hermosa yielded only 10% of the expected crop, with the rest lost to the disease. It is not hard to imagine how little this is to produce for a coffee farm and how much it affects the community that surrounds it. But as our experience with Edwin Jr and Edwin Sr. tells us, they are very forward looking and very progressive in the way they work to solve Roya’s challenges. What they did last year was to, as quickly as possible, replant 7000 coffee trees; mainly in the lots El Eden, El Mirador and El Sabinal. 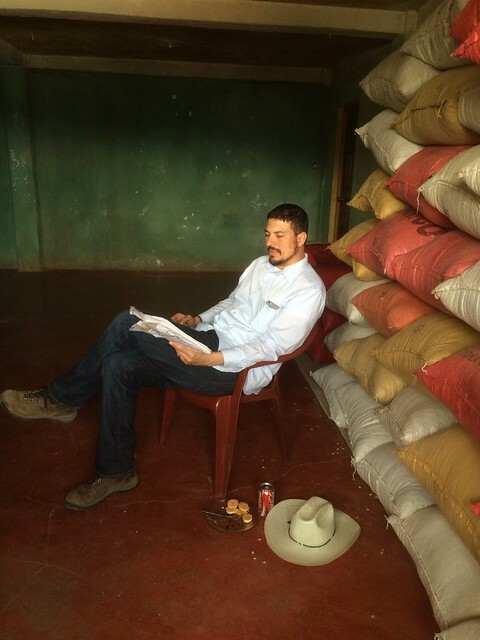 El Sabinal was hit so hard by Roya last year that it didn’t produce a single coffee cherry. Luckily this year the older coffee trees at Finca Vista Hermosa have shown signs of recovering and they are already back up to production levels of 50%, compared to the last normal pre-Roya production 4 years ago. Interview with Edwin Martinez Jr. The following interview is unedited. What do you think makes Finca Vista Hermosa outstanding? I live in Washington state for a lot of the year and that’s really unique. It means that there are some bigger challenges for me not being present all year, where as at a lot of other farms the owner can be present more, however, I find that compared to other farms our size that I or my father is at our farm just as much, or more, than other farm owners with farms the same size. Many of the farms we work with now, we go and visit those farms more than the owners do, so their is some value, I think, in having it multi cultural, that we can bring roasters that we understand to connect with people that are working with us on the patio, and we have managers that help us work with them in a way where we have amazing communication with them and it is very common that a farm owner is not communicating well with the people that are picking their coffee. They just have some clear objectives and they don’t really know each other, and so we’ve gotten to know our pickers very well and we work hard to try and provide for them in practical ways. Probably the biggest differentiator doesn’t have to do as much with the coffee as it has to do more with the people. People don’t wont charity, people that have needs appreciate help when their needs are meet, but it doesn’t feel good when you need help and people helps, you want to be able to take care of your self and so the biggest thing we do that I think differentiates us is that. Just valuing personal dignity and that translates to people that are working there, as if that was theirs, as if the land is theirs and it’s a lot easier to have someone do a great job when they feel pride in what they are doing, and when someone respects them. I think those are very universal things that you can apply in any relationship, in any business and they are very rare at the farm level between owners and people that are picking. There is a lot of disconnect and we try hard to just connect with them on a personal level. I think you can feel that when you are there. So you can tell me here as far as time goes? That was probably a longer answer than you wanted right? No that is totally fine, that was really good. What´s your biggest concern for the future of Finca Vista Hermosa? My biggest concern is ownership and management, the farm belongs to my parents and aunt and uncle. My father is 67 he is in excellent shape but there will come a time when he wont be able to do as much as he is doing and my grandfather is 96… I think, 97 maybe, and my grandfather isn’t going to the farm anymore but he did up until just last year I think. And the last 2 or 3 years it was just a couple of times and it was brief, but in his early 90’s he was still coming up regularly, so probably my biggest concern is that I know it is a lot of work. I know that there is more work than I can understand. And what I am doing is something different than what my dad is doing, and so it would be impossible for me to do what my dad is doing also, if I continue doing what I am currently doing. 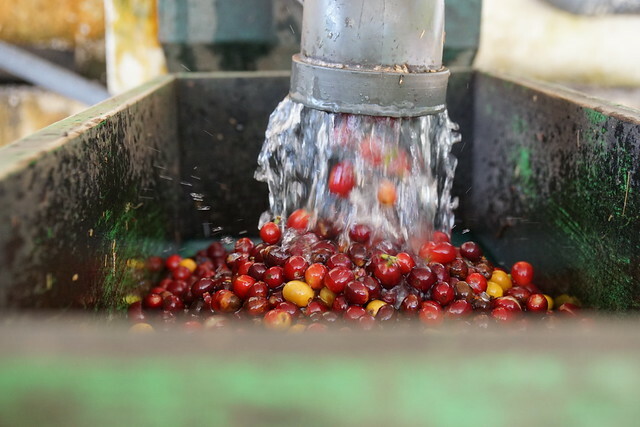 Which is basically everything from coffee coming of of the farm and connecting it all the way to roasters, and that is what we are doing under Onyx Coffee. And so then we started the name was Finca Vista Hermosa and as we began working with other farmers and connecting their coffee to other roasters we came up with the name Onyx. Under that we connect producers to roasters, so that is a lot of work, because traditionally there is a lot of links in that supply chain and we are doing almost all of them, so we are very small and I have a lot of respect and I always tell people that it is best to do one thing and do one thing well, and in all reality we are doing a lot of things. A lot of different steps, but we are doing a very small volume. We are limiting the size of our business based on how many people we can have good relationships with, so it keeps us pretty small but I can’t add what my dad and grandfather have done to what we are doing now without something changing, so there is an unanswered question that needs to be answered. So the last few years you have been hit by leaf rust in Huehuetenango and at Finca Vista Hermosa. What have you done to secure the future and how much have you had to replant? So to give you some perspective: last year (2015) we harvested 10% of what we harvested 3 years prior to that, that’s a 90% drop and, it was a steady drop, as it began to drop we thought that we could recuperate but we where not able to. So the biggest thing we have done to recuperate this year; we are bouncing back up, not all the way to where we where 4 years ago but we are going to be at, at least half way and probably more than half way, which is really exciting for us; but what we have done that had the greatest impact is not the actually steps to minimize or fight leaf rust, but it is educating other people on those steps and what happens if you don’t do them, and that is something that we all found out over time. If we do everything we can do but our neighbors don’t then the problem comes back, as if we never did anything at all. So the most valuable thing we have done is, as the problem has become clearly larger, we have communicated what we have done with our neighbors and what we are going to do, hoping they will do the same thing. And the problem became so bad that the problem becoming bad helped them to be on the same page with us, to be doing the same things and that is how we are recuperating. What´s your hope for the future of Finca Vista Hermosa? I have a lot of dreams but I think my hope is really nothing big. My hope is to do what we have done, which is to continuously improve a lot of little things. So I don’t foresee any major changes. I think that we are doing a lot of things well and I think that we can improve everything, and so to be constantly aware and asking and learning so that we can improve a lot of little things. Everything from controlling on the wet mill to how we are working with people. Different methods of planting. Just to work really hard to be educated and as aware as possible to be making little improvements all along the way. So really, I don’t have any big hopes or plans. I have a lot of fun ideas, but really the decisions or changes are never big changes from one year to the next. They are a lot of little ones who add up to big changes, so some of the changes we have now that are big changes from ten years ago, they didn’t happen in one year, they happened over the last ten years. Like our newest warehouse, it took 4 years to build and we completed it 5 years ago. The house that we stay in, and where we host you. We have clinics, medical and dental, and eye clinics there to. That took 18 years to build. It was originally housing for the pickers and we wanted to build some nice housing for the pickers, better housing. And once we built that, then we took the old pickers housing and we made that a place for us to stay. So little changes. What are your thoughts about how to trade in the coffee industry? Wow! This could be many pages on a blog, but to keep it short and sweet; I think that stability and sustainability are extremely important. It’s hard to be sustainable if you’re not stable. So, rapid growth is risky and doing too many things is risky. So I think for trading coffee, what I believe is most valuable and ideal is for people and companies to have a very thoughtful approach on who they choose to work with, and be very strategic and partner with people that maybe are in a similar space. If they are a much bigger company of course you will get some benefits from working with a much larger company, but if they are much smaller there is also some benefits, but they both have their risks. The much bigger company may not pay as close attention to you and the much smaller partner may not provide enough in the relationship and you’re going to want to then connect to others. I think strategic partnerships often looks like people and companies connecting that have a lot of similarities and that way it is easier to have a common language for what it means to be stable and what it means to be sustainable and then you can align other values and topics like quality in coffee and people and the land and the environment. And now to a bit lighter question, Edwin. How do you brew your coffee at home? Rowan, he is 3 and he puts 2 scoops in and he levels it. You know those white scoops that come with the Hario V60? He levels it so it´s about 10 grams and he will put 2 scoops in and he will grind it, then he will forget the filter so I always have to catch him before the coffee goes in, then he does everything else. He gets the water, puts the water in and then puts a carafe underneath. We need a little hot pad to lift the carafe as we have a Hario 02 server and it doesn’t manage to click the button to make it turn on, unless we lift it. So yeah, a Technivorm with a Hario V60. What was his name, your son? Rowan. And he loves making coffee. Yeah, looks like it runs in the family. Which coffee do you drink? We are very spoiled. Because we have in Bellingham a bar that is only open on Saturdays and only has black coffee. We feature coffee from 2 or 3 different roasters around the world, mostly in the united states because of cost. So we have 2 or 3 different roasters every week and we will have 1-2, sometimes 3 coffees from each roaster and so we often have anywhere from 6- 15 open bags, leftover open bags. So we usually have at least 10 different, amazing coffees and every week I will take those coffees, and maybe I will leave one bag, and the rest I just dump them into a mix and we share that with other people. Then I restock it with more coffee, so we probably have one of the most amazing selections in any house in North America every single week. It’s almost like a training lab for a roaster where they have a budget of $500 a month to just buy lots of different coffee so that they can taste them, that’s what it is like at our house. We also have 4 subscriptions. 2 of them send 3 coffees every time and that happens every month. We have The Coffee Collective! And that’s by fare the cleanest packing… No surprise there. That’s good… Umm, which question would you wish I had asked? I’m just realizing now that I had, what I put there. I answered it above already. Yeah cool – that was a good answer! My question was,” how important are relationships?” My answer to that is that I think it is really important to have shared risk and reward so that people, so you have a team perspective, and it is not one person pulling the other. That’s been very special for us with the The Coffee Collective, because when we started selling the coffee outside of just selling it to someone locally, The Coffee Collective was one of the very first companies we started working with. So it was, I think, a good balance as there was a lot of shared risk and reward. I didn’t know where it would go. It was far away and I didn’t speak Danish! I know it was the same thing for The Coffee Collective. I was communicating with Klaus primarily and our coffee was the first, or second, that came in. I think Daterra and ours both came in the very beginning. I think those where the only 2 coffees that The Coffee Collective had at the very beginning. So there was also a great sense of shared risk and reward there too. All pictures from this trip are available here on Flickr.